Leadership is such a complicated idea. One we try to boil down to trite quotes and phrases. We’ve all heard “Leadership is influence. Plain and simple.” or “Leadership is the impact you on another person’s life.” or maybe “Leadership is doing the right thing.” These leadership quotes are great. They give us an idea of what to shoot for but they also don’t tell you what you need to know about leadership before you begin to lead. Leadership is more complicated than a simple quote. You’re going to run into situations where cute leadership quotes won’t do anything for you. While leadership quotes are fun, quotes aren’t going to prepare you to lead well. And you need to be prepared to lead. 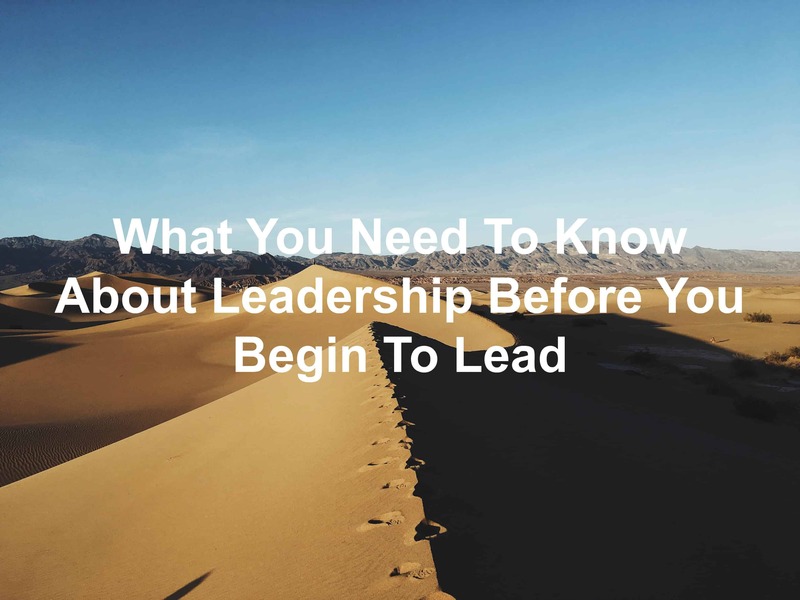 So, today, let’s talk about what you need to know about leadership before you begin to lead. Leadership is one of the greatest endeavors you’ll take on. Leadership is about taking people to a level they never thought they could attain. All the while, you’re also raising the level of your leadership. And while leadership is about influence, you have to do more than influence to lead well. You have to take the hard hits of leadership. You will need to accept responsibility for the failures of your team. This stings. Especially when you feel you’ve built a strong team with core competencies. You will, more than likely, struggle with these hard truths about leadership. Especially if you’re unprepared for the inevitable failures of you or your team. Not only will you have to deal with failure, you’re going to deal with personality conflicts, scheduling conflicts, and poor performance. These are hard truths to swallow as a leader. Be ready to face the fact that leadership isn’t easy. You can’t lead with a simple quote or a positive mindset. You have to have the backbone to lead in the difficult times. You can get through the hard times of leadership. You need to be prepared, though. That’s why you need to know difficulties to expect when you become a leader. When you know these, you can prepare for the challenges of leadership. Failure: Realize failure will come. When you do run into failure, accept it. Accept that there was a problem and look for a way to correct the problem. Then make the best out of the bad situation. Loss: You’re going to lose team members and followers as a leader. Whether they transfer to a new department, quit your organization, or give up, there will be losses. Knowing you will lose people can ease the burden when the loss comes. Be ready to replace the lost team member and continue to move the team forward. Disagreements: With leadership, you’re dealing with different personalities. This means there will be disagreements. John won’t agree with Suzie. Or Tonya might have an idea Jim doesn’t like. These are disagreements and they happen in any healthy relationship. Be willing to help your team members walk through their disagreements. Set boundaries to help keep the disagreements in check. Success: As a leader, you’re going to face success. You may believe success is easy to handle. You’d be wrong. Success has derailed many great leaders. Be ready for the pitfalls of success: Ego, pride, over-confidence, and more. Be willing to put your own feelings in check to make sure you’re not getting too big for your britches. When you prepare yourself with the knowledge of what you need to know before you begin to lead, you can sidestep a lot of the traps young leaders fall into. Take the time to prepare yourself for leadership instead of filling yourself with fluff. Question: What’s one thing you wish you would have known about leadership before you began to lead? Let me know in the comment section below.